A drama was played out at about 8 am at the Baruah Chariali here on Sunday with two youths frantically calling up 108 for an ambulance to take a mentally-challenged woman, who was about three months pregnant to the Jorhat Medical College and Hospital for care and treatment. It was an abortive attempt, for neither could they contact the 108 service centre despite calls from different service providers nor could they persuade the woman to have breakfast and delay her from leaving the place so that they could arrange alternative transportation. Labour Inspector Chayanika Goswami, attached to the Assistant Labour Commissioner’s office here said that she had been informed about the woman, who frequented Baruah Chariali at a particular time by two youths – Sankab Sharma Kashyap and Anirudha Kashyap – working for a nongovernmental organization Dhrishti Nation, a few days ago. Dhrishti Nation, established here in 2016, is engaged in rescuing and helping children, destitute, abandoned people and victims of abuse to find shelter and justice and Government departments have to coordinate with NGOs like Dhrishti as social welfare works have been outsourced to these agencies by the Government. “I was coordinating with both of them and they were frantically trying to contact 108 but in vain. The number just did not ring although they tried from different phones. I told them to give her some food but she got scared and fled,” Goswami said. “We will give it a try tomorrow and this time, take her by auto or some other vehicle if required,” she said. Goswami said that trying to get through to 108 was very exasperating. Others have also complained about not getting through to 108 service centre. “Imagine, if this would have been an emergency,” she said. “It is imperative that she be given care and treatment if required and shift her to some secure place if possible as she is not in a mental state to take care of herself,” Goswami said. The Labour Inspector further said that she had been told that drivers sometimes had to work 12 hour shifts due to which sometimes they too did not receive calls from the centre. This correspondent got through to the centre after four attempts after calling from different telephone service providers. The girl at the other end, on being asked whether no one attended the centre at 8 am, said that this was a 24-hour service and that someone or the other was always there. She further said that most likely it could be a network problem. 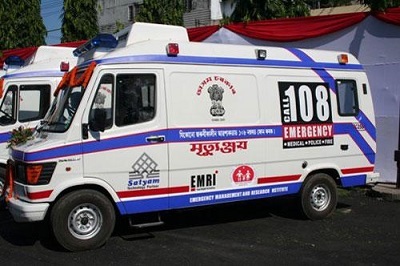 Members of Dhrishti Nation have, however, not had a very good experience with the 108 ambulance service. “On an earlier occasion, a man, who had met with an accident and was lying at the Mitha Pukhuri area, was refused to be taken in the ambulance because he was dirty and stinking. If this is the attitude of our health care attendants, then God save us,” Sankab said. They had to wash and clean him up before taking him in an auto but he died soon after reaching the hospital. Goswami too did not mince her words while talking about the service at Jorhat Medical College and Hospital. “The doctors ask why we bring these people here. Once we had taken a woman who had been abandoned by her step sons and own daughter, she was the second wife of a rich man, but she had been left to fend for herself in a pitiable state. After admitting her to the hospital, we saw that she was seldom bathed by the nurses and I had to berate them for this. If a patient did not have a relative to collect food from the trolley then also the nurses were not bothered to go and give her the food. Sometimes, Sankhab and Anirudha used to take something to eat for her from outside,” Goswami said. Sankab said that women too had died in the hospital without being reconciled with her stepsons, all working in the ONGC, despite ADC Tapan Gohain trying for a patch up and meeting them a few times. She was cremated by her daughter without being taken home. “On seeing all this – be it the driver of an ambulance, doctors, nurses and such children – it seems that humanity no longer exists,” Goswami said.